Wouldn't want to be the guy that checks the tire pressures on that trailer. Something else that really surprised me is that 14 of these engines operating all year will emit more pollution than all of the cars in the world combined. The bunker oil they use is cheap, currently around $262/tonne (I guess when you are using 250 tonnes/day, litres or gallons are just not significant) but the sulphur content of bunker oil is around 2000 times of normal gas/diesel so the sulphur dioxide emissions are huge. Yeah, that's a great big engine and all, but what kind of anchor does he use? Still insignificant compared to one volcanic eruption which put out more than all of human history combined. Just played with some numbers. Depending on density of the fuel, came up with about 25 to 27hp per gph. A good little marine engine in the 400hp class at best is 20-21hp per gph. BTU/lb of that heavy fuel is probably a good bit higher than diesel, so that would have some effect. "BTU/lb of that heavy fuel is probably a good bit higher than diesel, so that would have some effect." Good point , one of the reasons diesels seem to be more efficient than gas , heavy fuel. The heavy bunker fuel may have sand, pebbles and other items in every ton, and has to be heated just to get it to flow. ...together indicate that the yearly SO2 output from anthropogenic sources is greater than from any single volcanic eruption in the last century. well there ya go, guess I was wrong. So "yearly SO2 output from anthropogenic sources is greater than from any SINGLE volcanic eruption in the last century." So you are comparing anthro emissions to a single eruption. Are there not hundreds of eruptions worldwide each year? Some going on near continuously? Is that sneaky wording quoted or a mis-type? Funny your should bring this up. Earlier today I went looking at BTU/gal to see what the difference is. #2 diesel is 139,000 btu/gal, and #6 fuel is 152,000/gal. So it accounts for about 10% of the specific fuel consumption improvement, but the rest is the engine. 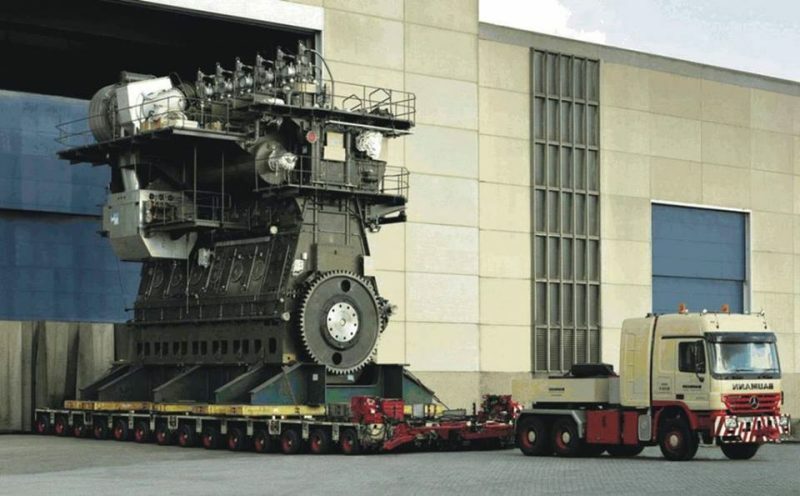 A typical diesel burns around 230 g/kwh, where this monster only burns 171 g/kwh. Owner of the tug company I used to work for opined that roughly one gal of fuel is burned per day (24 hours) per horsepower. Some of their bigger tugs are between 3-5000HP so roughly that much fuel a day is burned in gallons, while towing. They have big tanks too. This was nearly 20 years ago mind you. This seems like a huge amount of CO2, but a visit to the U.S. Department of Energy's Carbon Dioxide Information Analysis Center (CDIAC) website (Carbon Dioxide Information Analysis Center (CDIAC)) helps anyone armed with a handheld calculator and a high school chemistry text put the volcanic CO2 tally into perspective. Because while 200 million tonnes of CO2 is large, the global fossil fuel CO2 emissions for 2003 tipped the scales at 26.8 billion tonnes. Thus, not only does volcanic CO2 not dwarf that of human activity, it actually comprises less than 1 percent of that value. Which produces more CO2, volcanic or human activity? We were talking SO2, not CO2. Ski, I was replying to Warwgn who claimed that "one volcanic eruption put out more than all of human history combined". Still waiting to hear what his source was for that claim. But according to USGS, human activities release at least a hundred times more CO2 every year than all the world’s volcanoes combined. Since this is said human activities I assume (I know it's dangerous) that includes exhaling. Therefore I have pledged to stop breathing for at least one minute every hour. This way I will not be contributing to the excessive Co2. Waypoint's are abstract, often having no obvious relationship to any distinctive features of the real world. Man's activities add about 79 Tg sulfur to the atmosphere each year. In an average year, volcanoes release only 13% of the sulfur added to the atmosphere compared to anthropogenic sources. The engine only cares about the weight of the fuel, that is what specific fuel consumption is about. That is why BSFC is given in g/kWh or lb/hph All this talk about gallons is nonsense. Since petroleum volume changes considerably with temperature and a gallon is not the same volume in all countries it is not used to measure power production. It has a BTU content of between around 18500 to a bit less than 20000 BTU/LB which is the same as ULSD and maybe a bit less than gasoline. That engine typically burns what is called IFO 380, an "intermediate fuel oil" which is a mix of heavy fuel oil and a distillate like diesel fuel. It is thick at room temperature but will usually flow like lube oil. It has a maximum pour point around 30*C or about 85*F and a minimum of around 0*C or 32*F. It is warmed to transfer more easily and is heated to around 250*F to reach about the same viscosity as SAE 40 motor oil just before being delivered to the injectors. It is most certainly not full of sand, rocks, and pebbles.